Abstract: A 90mm fan spins quietly at the center of it all, and with Zalman's Fanmate 2 fan speed controller noise can be reduced even further for true silent cooling (as low as 36.4 dBA in our real world tests). 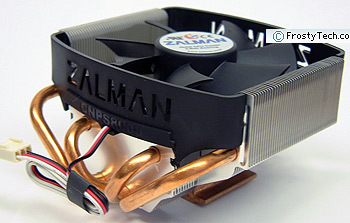 The Zalman CNPS8000 is pegged as a low noise, low profile heatsink ideal for compact computers, largely because it stands just 63mm tall. The heatsink is a significant departure from Zalman's traditional toolbox of manufacturing techniques, and it seems this may be the first nail in the coffin of what has been a long history of creating coolers out of tightly packed fins of metal. The CNPS8000 is assembled by rather standard means that lack the elegance, and dare I say beauty, that many of Zalman's 7000-series fan shaped heatsinks possessed. Aluminum fins, four sintered metal wick copper heatpipes and a forged copper base form the basis of what is called the CNPS8000 heatsink. A 90mm fan spins quietly at the center of it all, and with Zalman's Fanmate 2 fan speed controller noise can be reduced even further for true silent cooling (as low as 36.4 dBA in our real world tests). The Zalman CNPS8000 heatsink is compatible with all current AMD Athlon64 processors (754/939/940), and in particular the just introduced 940-pin processor socket AM2 processor and its revised 'M2' heatsink retention frame. The CNPS8000 can also be used on socket 775 Intel Pentium processors just as easily thanks to interchangeable metal mounting clips. The clips slide onto the heatsink just above the copper base, without the use of tools. The CNPS8000 heatsink is compact and weighs a feathery 350grams, light compared to some recent Zalman coolers like the CNPS9500 AM2 or CNPS7000A-Cu. The Zalman FanMate2 fan speed controller is used to tweak the fan from an audible 2600RPM, right through to the very quiet speed of 1400RPM. The Zalman CNPS8000 heatsink retails on average for about $50USD ($58CDN). Materials: Aluminum fins, copper heatpipes and base. The Zalman CNPS8000 heatsink ships with two sets of stamped steel mounting clips for either socket 775 or socket 754/939/940/AM2 processors. 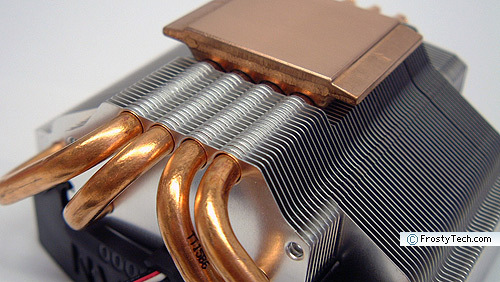 The two-part clips slide together over the copper base, and provide a firm basis to hold the CNPS8000 cooler on the CPU below. 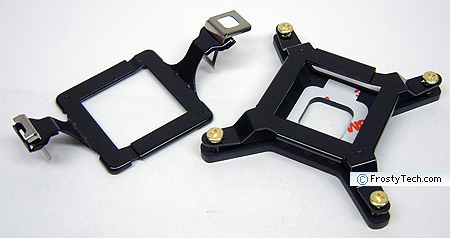 The socket 775 bracket comes with a matching rear-motherboard support bracket, so you'll need to remove the computer from the chassis to install the CNPS8000 heatsink if it's an Intel PC. The AMD K8 heatsink clip attaches to the center tab on both types of K8 heatsink retention frames, and can be installed without any tools. Zalman bundle in a manual fan speed controller with just about every heatsink it sells these days. The Fanmate 2 gives users an adjustable dial to control the speed of a fan connected to the small device, which is great for individually dialing down the speed of certain fans to suit your environment. The Fanmate 2 unit is rated for fans drawing up to 6W power, and will output ~11V to 5V depending on where the dial is set to. 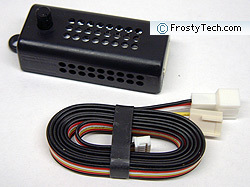 Measuring 70 x 26 x 26mm in size, the black plastic Fanmate 2 box controls a single fan via a 3-pin power connector. Currently, there is no solution for 4-pin PWM fans on the market. At the Fanmate 2's maximum speed setting (loudest noise, fastest RPM) the unit offers a slight amount of resistance so the fan will not spin quite as fast as if it were not attached (the difference is about 5%). On the lowest speed setting (quietest noise, lowest RPM) the fan should be running essentially silently with just 5V being delivered. It is important to only use the FanMate 2 with good quality fans that can restart by themselves if the fan stalls. Poor quality fans can occasionally stop spinning at very low RPMs (or if a loose wire gets entangled) and if this happens you don't want the fan overheating and catching on fire. FrostyTech's K8 Test Methodology is outlined in detail here if you care to know what equipment is used, and the parameters under which the tests are conducted. Now let's move forward and take a closer look at this heatsink, its acoustic characteristics, and of course it performance in the thermal tests!